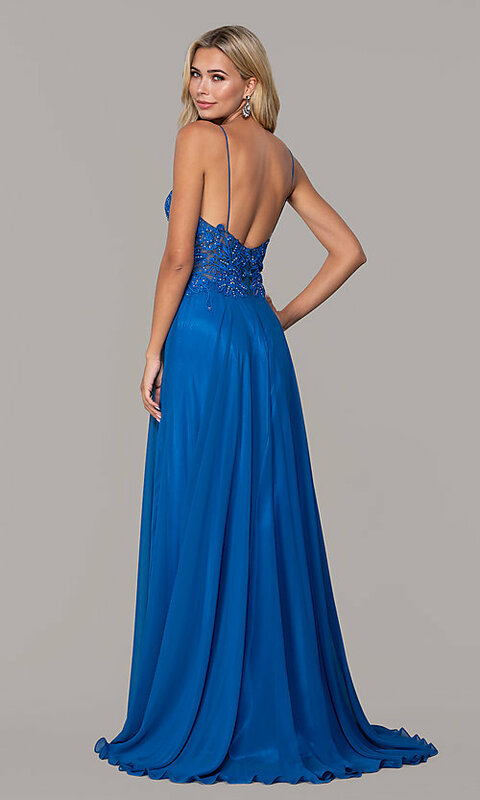 In junior sizes, this long chiffon prom dress by Dave and Johnny is a stunning choice for your next big formal event. Made of light chiffon and exciting embroidery, the floor-length evening dress has a beautiful style ideal for galas, military balls, and other formals. The sheer embroidered bodice is decorated with exciting shapes down to the natural waistline, and bead-embellishments draw attention to the fun detailing. A v-neckline gives the sleeveless bodice an extra splash of intrigue to complement the eye-catching elements. The long chiffon skirt finishes this chiffon prom dress, flowing over the hips to the floor with the comfort of a satin lining.